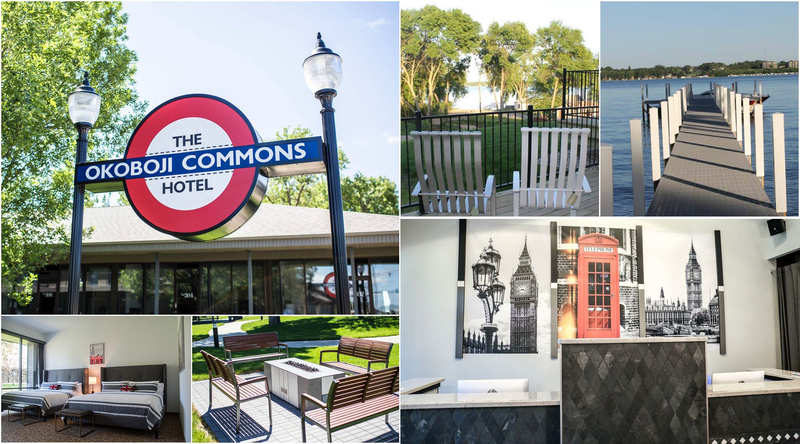 BRAND NEW, urban metro hotel featuring 70 guest rooms, complimentary wi-fi, Parliament Meeting Space for up to 80, Buckingham Board Room, James Bond Executive Boardroom Suite, Sean Connery Luxury Suite, Gazebo, Courtyard Area with gas fire pits, grills and a large deck overlooking East Lake. Hammock lounging, wood fire pits, new dock on East Lake Okoboji. Smack Shack Sandwich Eatery, “smashing good sandwiches” – The Commons Tasting Room, featuring unique cocktails & small plates. Located on the Bike Path, across the street from Brooks Golf Course, Okoboji Summer Theatre and convenient to all Okoboji attractions. Expect unparalleled design and customer service. We are a bloody fabulous hotel and excited for you to be our GUEST!